Many pet parents believe if their dog’s nose is warm or dry, it means they’re sick. Actually, that’s a myth. A warm dry nose by itself doesn’t mean your pooch is under the weather. Normal, healthy dog noses go from moist and cool to warm and dry and back again quite easily. However, it’s important to distinguish between a moist nose and a runny nose. Runny noses aren’t nearly as common in dogs as they are in children (thankfully), but they do happen, and for a variety of reasons. If your four-legged family member develops nasal discharge (the technical name for a runny nose), it’s important to investigate the cause. In some dogs, an entirely harmless reason for occasional colorless, odorless, watery discharge from the nose can be exercise or excitement. Another cause of this type of runny nose is irritation of the nasal cavities from seasonal or environmental allergies, or an inhaled foreign object. If your dog has been playing outdoors and suddenly develops nasal discharge, especially with sneezing, I recommend making an appointment with your veterinarian. If you notice your dog’s nose tends to run whenever spring rolls around, or each time you light a scented candle in your home (which I don’t recommend, by the way), she could be dealing with seasonal allergies or an irritant in her indoor environment. Household chemicals that trigger a runny nose and sneezing in people can cause the same symptoms in dogs. Indoor irritants like cologne, cigarette smoke, household cleaners, fiberglass, pesticides and aerosol deodorants can trigger a reaction in sensitive dogs. Situations like these should be addressed to identify and eliminate or at least minimize triggers related to your pet’s nasal discharge. Seasonal and environmental allergies in dogs tend to start out mild, but grow progressively worse over time. A seemingly harmless occasional runny nose caused by an allergen can turn into a significant allergic response, which in dogs is most often expressed through the skin. Intense itching, hot spots and other skin problems are very often the culmination of months or years of unaddressed allergies. It’s also important to note that in brachycephalic breeds (dogs with flat or “pushed in” faces) the nasal passages are compressed. This can trigger a runny nose and other symptoms when there’s an upper respiratory infection or exposure to irritants. 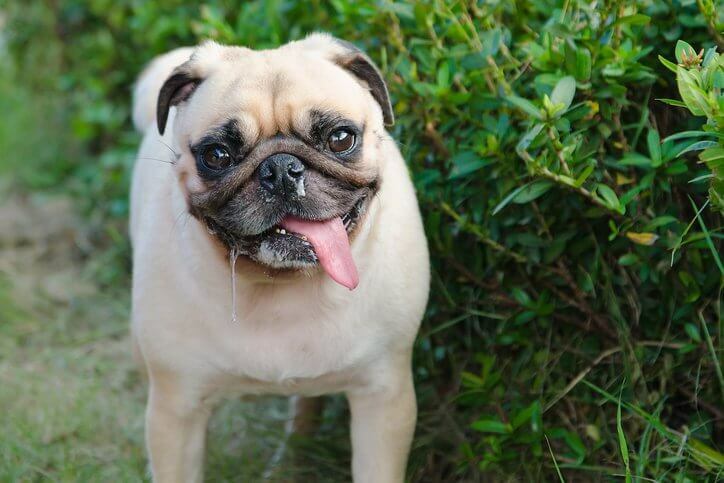 These breeds include the Boston Terrier, Bulldog, Cavalier King Charles Spaniel, Pekingese and the Pug. There are several more serious reasons for nasal discharge in dogs, most of which also involve sneezing, coughing or other symptoms. The following five potential causes for your dog’s runny nose require veterinary attention. 1.Foreign bodies — A “foreign body” in your dog’s nose means there’s something in there that shouldn’t be. For example, if your furry family member likes to dig in the dirt or obsessively sniffs the ground, chances are she’ll wind up with some soil, grass or the occasional bug up her nose. This can cause her nose to run, and will also trigger sneezing to expel the foreign material. Hunting and sporting dogs who spend a lot of time outdoors running at full speed through natural settings can also wind up with odd things (e.g., twigs or sticks) up their nose. Sneezing and nasal discharge are your dog’s body’s attempt to expel the foreign invader. Sometimes, however, medical intervention is required. Signs of the presence of a foreign object in your dog’s nose include sneezing, pawing at the nose and nosebleeds. You might also notice your pet’s breathing is noisier than normal, and there might be a visible bulge or lump on one side of the face or nose. 2.Foxtails — Foxtails are treacherous little plant awns that are ubiquitous in California, reported in almost every state west of the Mississippi and have recently spread to the east coast as well. In late spring and early summer, foxtail plant heads turn brown and dry, and scatter across the landscape. The tiny spikes on the plant heads allow them to burrow into soil, and wildlife also helps spread them around. The foxtails can eventually make their way into the noses, eyes, ears, mouths and just about every other opening of a dog’s body. They can get deep into your dog’s nostril or ear canal or under the skin in no time, and often too fast for you to notice them. If your dog’s nose suddenly starts running and he’s sneezing uncontrollably, he could have a foxtail in his nose. If you suspect he’s been exposed to foxtails or is exhibiting suspicious symptoms, I recommend you consult your veterinarian or an emergency animal clinic as soon as possible. 3.Infections — Whereas bacterial and viral infections of the upper respiratory tract typically cause coughing, an infection caused by the opportunistic Aspergillus fungus causes sneezing and nasal discharge. A nasal Aspergillus infection is thought to develop from direct contact with the fungus through the nose and sinuses, which occurs when a dog is exposed to outdoor dust, hay or grass clippings. Symptoms include pain and bleeding and/or discharge from the nose, sneezing and visible swelling. In addition, an infected tooth or its root can cause sneezing and nasal discharge. In canines, the third upper premolar has roots that are very close to the nasal passages. If this tooth or one close by becomes infected, sneezing and nasal drainage can be the result. 4.Nasal tumors — Chronic nasal discharge and sneezing can be symptoms of a nasal tumor. These tumors are unfortunately fairly common in dogs, especially breeds with longer muzzles like the Collie. Second- and third-hand tobacco smoke has been identified as a significant cause of nasal cancer in pets. Most types of nasal tumors do not metastasize, but they do spread locally, destroying the structures of the nose. 5.Nasal mites — Nasal mites are microscopic little bugs that can take up residence in your dog’s nose and sinuses. They cause terrible itching in the nose, which triggers fits of sneezing, as well as chronic nasal discharge and even nosebleeds. Your dog can get a nasal mite infestation by digging in the dirt with her face, or by going nose-to-nose with an infected dog. The mites can be identified by taking a nasal swab and looking at it under a microscope. If there is an infestation, the mites will be visible. If you notice nasal discharge, swelling or an unpleasant odor from your dog’s nose or the area around it, or if she seems to be having trouble breathing or is making abnormal respiratory sounds, it’s time to make an urgent appointment with your veterinarian.